The Damselfly has a common insect like body, with an abdomen, six legs, four wings, a thorax, and an exoskeleton that forms into a head. 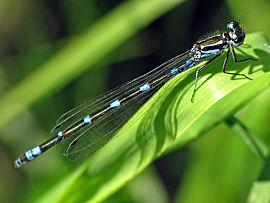 There are certain parts to the Damselfly that makes it unique and different from the Dragonfly. Head The Damselfly's head is rather big and the majority of it is taken up with the two compound eyes that are farther up on the head and is towards the side. Each compound eye is made up of thousands of facets, lens like visual units. Beneath the eyes there are the chewing mouthparts, which it eats its food with. The central plate, which is positioned right below the compound eyes and right above the mouthpart, is separated from the frons, a frontal lobe. Also near the compound eyes are the antennas. Thorax The thorax has two segments; the prothorax and the pterothorax. 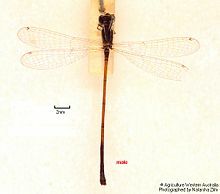 The prothorax is right next to the head and contains the front two legs where as the pterothorax is the midsection that contains the other two legs. The pterothorax also contains the wings and the flight muscles which helps it fly. Legs The legs on a Damselfly have three main parts; femur, tibia, and tarsus. In the tarsus there are three segments and at the end of them there are two claws with spiny spurs lining the femur and tibia. The legs on a Damselfly are not used for walking instead they use them for perching, scooping up and handling prey, and the front two legs they use them for grooming their head. Abdomen There are ten segments in the abdomen. In the segments there are a couple main parts; the sexual appendages and the secondary genitalia of males. In the secondary genitalia you can see the hamules (hook like structures) visible from the eye. 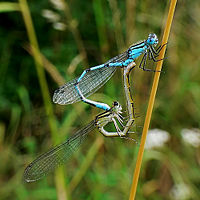 For male damselflies the sexual appendage is used to grasp the female during mating by the rear of the thorax. The females have an ovipositor which contains paired valves and cutting blades, that is used for inserting eggs into; mud, plant tissue, or some other kind of substrate. You can find Damselflies near; creeks, ponds, bogs, lakes, waterfalls and many rivers. Many of them like slow running water with reeds, rocks, and other plants where they can mate and lay there eggs. The metamorphosis for Damselflies is different then a normal metamorphosis because they don't have a pupa stage. 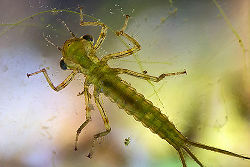 The larva will spend one to three years in the water by using its tail to breathe. It also will feed on mosquito larva for its food. Right before it molts its last skin and becomes an adult it will climb up from the water. Once it is an adult it will only live for a few weeks. 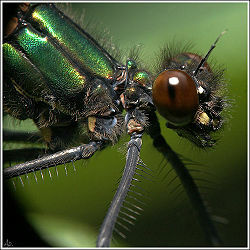 Damselflies like to eat insects such as; a mosquito, midges, flies and winged ants. They will eat all insects that they can by using their front two legs and chewing them up with their mouthparts. There are over 5,300 known species of Damselflies in the world today. They can fly up to 30 mph. There eyes are able to see objects up to 15m away from them. Odonata means "toothed jaw", Damselflies has huge mouth parts to crush there prey with. When at rest the Damselfly holds its wings at its side whereas Dragonflies don't . Some Damselflies live for 6 or 7 months if in very hot and dry climates.